Today was the final tomato removal day; I had spent several weekends cleaning out the ones that didn't have any fruit on them, and left others to ripen. However I knew that today was T-Day, and with a heavy heart I took out everything that was left. As you can see, there were still many big green tomatoes on the vines. I picked them, and hope that they will ripen. However I'm guessing they will not, as none of these have even 'broken' - that is, none of them have any color at all. 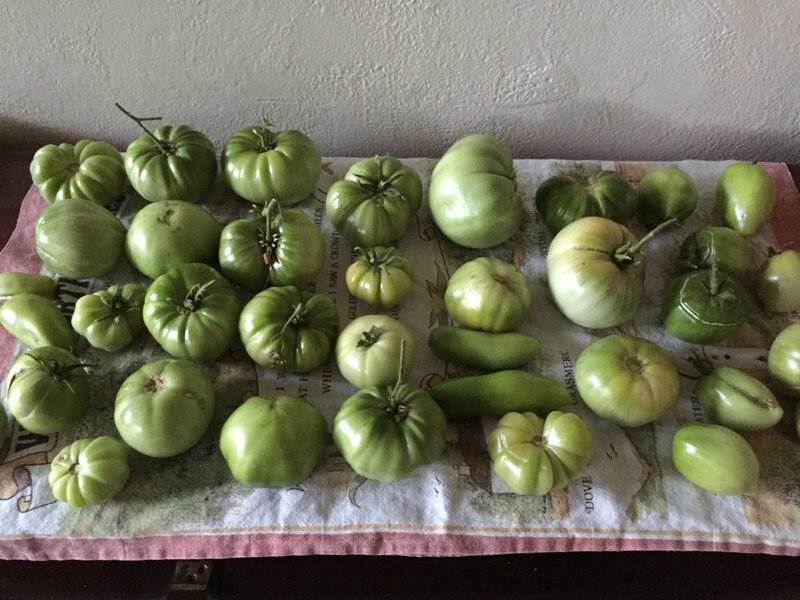 Perhaps I'll make some green tomato chutney or salsa. Luckily we still have a few ripe tomatoes to enjoy, and then that will be it until next June. Come December, we'll be glad for our canned and frozen tomatoes. Extra work in the summer pays off, big time, in the winter. Tomato removal day is a long and tiring one. First I have to remove the vines and put them in the compost, then I have to remove all the twine that I used - so much twine - and that goes in the compost too, and then I have to dig up the stakes, four to each bed, and then I have to remove the straw mulch and either give to the chickens or add to the paths, and then I have to take out the drip lines and rake the dirt, and then I add a cup or so of worm castings to the top of the bed, and then I replace the drip lines, and then I water everything thoroughly to get it ready for planting tomorrow. Oh yes, tomorrow is another long day, but this time I'll be adding to the beds rather than subtracting. Everything looks empty and forlorn, but I take heart that in a couple of weeks, green shoots of garlic, shallots, and wheat will be poking their heads up and starting their winter journey. The butterflies are out in full force in the warm autumn days; I see the usual characters daily. But I got a surprise visitor today and I did not get a very good picture, the visitor was nervous about me and it was shady. This is a female Zerene eurydice, or California Dogface, our state insect! Or; it also could be the Alfalfa butterfly, or Colias eurytheme. Either way I'm excited because it's a new butterfly in our garden. I'm telling you, Tithonia (Mexican Sunflower) is the biggest pollinator attractant. Everything loves it! Anyway I'll keep my eyes peeled for more of these beautiful butterflies. I'm sore, tired, and ravenous, but it was a good day's work. 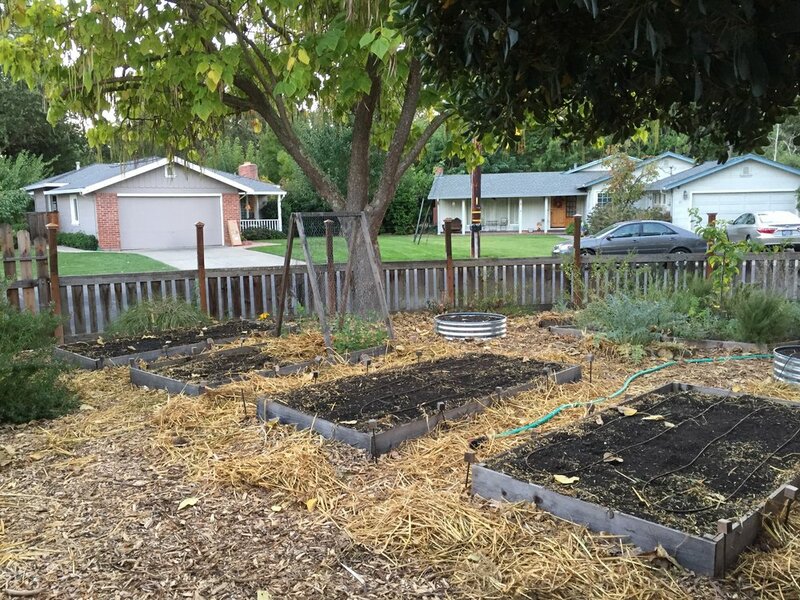 How are things going in your fall garden?